This article covers the basics of software architecture. There are some good articles out there, but still developers struggle to understand the basic concepts, and more importantly, the way to apply them correctly. Newcomers will always struggle to understand a precise definition of a new concept, because it is always a new and hence unfamiliar idea. It will be difficult. When you start to design your very first system, you will try to apply everything you know or learned from everywhere. “The knowledge of the actions of great men, acquired by long experience in contemporary affairs, and a continual study of antiquity” – seems applicable here, isn’t it? If you are a developer, who has a minimum of three or more years of continuous development experience and has that hunger to learn more, to step-in to the next level to become a software architect, this article is for you. OOP is a design philosophy. Use different sets of programming languages. In OOP’s everything is grouped as Object. Able to gain reusability by means of four OOP’s concepts. Let’s take your hand as an example. Object can be considered as a thing that can performed related set of activities. The set of activities that can perform by object is called object’s behavior. It’s a blueprint / plan / template that described the details of object. Class is composed of three things. How to identify and design a Class? It achieved mainly by creating classes, the classes expose public methods and properties. The class is a kind of container / cell / capsule which encapsulate set of method, attribute and properties to provide its intended functionalities to other classes. It’s a (*a*) relationship between two classes. It allows one object instance to cause another to perform an action on its behalf. In more general term, it used to create relationship between classes where one class uses another class. It’s a (*the*) relationship between two classes, when object of one class has an (*has*) object of another. If second is the part of first, then it called aggregation. Abstraction is emphasis on the idea, qualities and properties rather than particulars. The important of abstraction is derived from its ability to hide irrelevant details. It is essential in the construction of programs. The primary means of managing complexity in the large systems. Abstraction is closely related to generalization. It reduces complexity by replacing multiple entities by which perform similar functions with a single construct. The primary means of managing complexity by collecting individuals into groups and providing a representative which can be use to specify any individual of groups. It can be only be use as a super class for other classes that can extend the abstract class. They are ideal when implementing frameworks. It separates the implementation and defines the structure. Interface can be used to define a generic template and then one or more abstract classes to define partial implementations of the interface. If the class that implements an interface doesn’t define all the methods of interface then it must be declared as abstract class and method definition must be provided by the subclass that extends the abstract class. Class can be defined to implement an interface and also it supports multiple implementations. When class implements an interface, an object of such class can be encapsulate inside an interface. Differences between Class & Interface? What are implicit and explicit interface implementations? The concept of implicit and explicit interface implementation provide safe way to implement methods of multiple interfaces by hiding, exposing and preserving identities of each of interface methods, even when method signatures are same. Ability to new class to be created, from an existing class by extending it is called Inheritance. 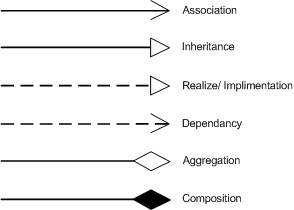 Inheritance is closely related to specialization. It is described as (is-a) relationship. When we say that Dog is mammal, we mean that Dog is specialized kind of mammal which contains all characteristics of any kind mammals, but it specializes these characteristics to familiar characteristics. A generic term means Many Shapes. In OOP’s, define as the ability to request that the same operations be performed by a wide range of different types of things. Ability to define several methods all with the same name. What is Use – Case? A class diagrams are widely used to describe the types of objects in a system and their relationships. Class diagrams model class structure and contents using design elements such as classes, packages and objects. Class diagrams describe three different perspectives when designing a system, conceptual, specification, and implementation. These perspectives become evident as the diagram is created and help solidify the design. Package diagrams are used to reflect the organization of packages and their elements. When used to represent class elements, package diagrams provide a visualization of the name-spaces. 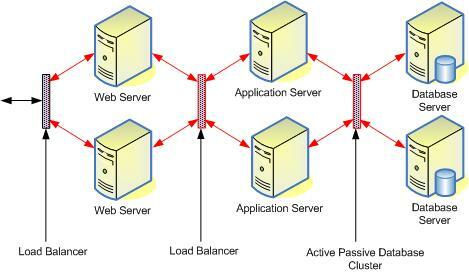 The two-tier architecture is refers to client/ server architectures as well. According to the modern days use of two-tier architecture the user interfaces (or with ASP.NET, all web pages) runs on the client and the database is stored on the server. The actual application logic can run on either the client or the server. So in this case the user interfaces are directly access the database. Those can also be non-interface processing engines, which provide solutions to other remote/ local systems. In either case, today the two-tier model is not as reputed as the three-tier model. The advantage of the two-tier design is its simplicity, but the simplicity comes with the cost of scalability. The newer three-tier architecture, which is more famous, introduces a middle tier for the application logic. What is Three – Tier – Architecture? Three-tier is a client-server architecture in which the user interface, functional process logic, data storage and data access are developed and maintained as independent modules, some time on separate platforms. The 3-Tier architecture has the following three tiers. Presentation Tier or Web Server: User Interface, displaying/ accepting data/ input to/ from the user. Application Logic/ Business Logic/ Transaction Tier or Application Server: Data validation, acceptability check before being added to the database and all other business/ application specific operations. Data Tier or Database Server: Simple reading and writing method to database or any other storage, connection, command, stored procedures etc. Model : DataSet and typed DataSet (some times business object, object collection, XML etc) are the most common use of the model. View : The ASPX and ASCX files generally handle the responsibilities of the view. 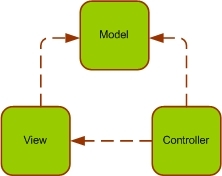 Controllers : The handling of events or the controlling is usually done in the code-behind class. What is Data Access Layer? What is Business Logic Layer? I have become aware that not everyone agrees to what business logic actually is, and in many cases it's just the bridge in between the presentation layer and the data access layer with having nothing much, except taking from one and passing to the other. As a general advice when you define business entities, you must decide how to map the data in your tables to correctly defined business entities. The business entities should meaningfully define considering various types of requirements and functioning of your system. It is recommended to identify the business entities to encapsulate the functional/ UI (User Interface) requirements of your application, rather than define a separate business entity for each table of your database. What are GoF (Gang of Four Design Pattern)? 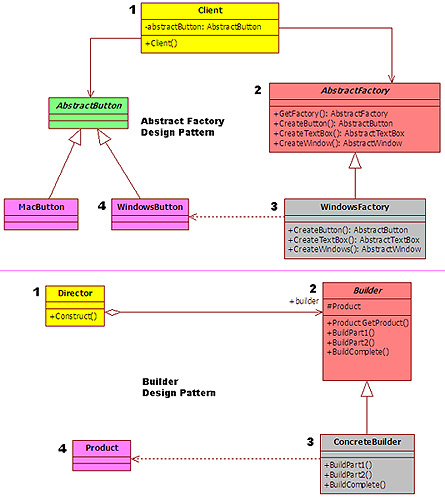 Difference between Abstract Factory and Builder Design Pattern? The two design patterns are fundamentally different. However, when you learn them for the first time, you will see a confusing similarity. So that it will make harder for you to understand them. But if you continue to study eventually, you will get afraid of design patterns too. If you observe the figure carefully, you will see an easily understandable color pattern. Both patterns have used a generic class as the entry-class. The only difference is the name of the class. One pattern has named it as “Client”, while the other named it as “Director”. Here again the difference is the class name. It is “AbstractFactory” for one and “Builder” for the other. Additionally both classes are of type abstract. Once again both patterns have defined two generic (WindowsFactory & ConcreteBuilder) classes. They both have created by inheriting their respective abstract class. Finally, both seem to produce some kind of a generic output. Abstract Factory, Builder, and Prototype can use Singleton in their implementations. So the conclusion would be that the two design patterns exist to resolve two type of business problems, so even though they look similar, they are not. What is Implementation or Behavior? The code inside the method is called Implementation / Behavior. Early binding means that our code directly interacts with the object, by directly calling its methods. Early binding also allows the IDE to use IntelliSense to aid our development efforts; it allows the compiler to ensure that we are referencing methods that do exist and that we are providing the proper parameter values. Late binding means that our code interacts with an object dynamically at run-time. This provides a great deal of flexibility since our code literally doesn't care what type of object it is interacting with as long as the object supports the methods we want to call. Because the type of the object isn't known by the IDE or compiler, neither IntelliSense nor compile-time syntax checking is possible but we get unprecedented flexibility in exchange. When you talk about designing a software system, the correct handling of OOP concept is very important. In order to do it, the foundation of a system places a vital role. The design or the architecture of a software system is the foundation. It hold the system together, hence designing a system properly (this never mean an *over* desinging) is the key to the success.